Garage A. Prieur & D. Brunette is a one-stop shop for all your auto repair services. For preventive vehicle maintenance and repairs or just a mechanical inspection before a road trip, at your Pneu Select branch you will receive quality service and the expertise of our skilled employees. Our experts are up-to-date on auto manufacturers’ recommendations and know what your vehicle needs. Every vehicle undergoes wear over time, not to mention ever-present road hazards. Depending on your mileage and the maintenance schedule recommended by your manufacturer, you need to carry out regular preventive maintenance. This prolongs the life of your vehicle and ensures optimal operation. At Garage A. Prieur & D. Brunette, we provide all preventive maintenance programs according to manufacturers’ specific recommendations... and more besides! Your tire specialist for over 25 years, Garage A. Prieur & D. Brunette Inc. is the benchmark for tire purchase, repair and installation. We have trained consultants to assist you with your tire choice among major brands such as Michelin, BFGoodrich, Uniroyal, Yokohama, Continental, General Tire, Goodyear, Dunlop, Bridgestone, Firestone, Pirelli, Toyo, Hankook, Kumho, Vredestein, Marshal, Multi-Mile, Maxtrek, Falken, Wanli, Hercules, Sonny, Nexen, Nokian, Federal and Cooper. Call now for a consultation. Wheel alignment results in reduced tire wear, better fuel consumption and safer driving. However, road conditions and your driving habits (frequent trips over potholes, rubbing against the curb, etc.) can change the alignment of your wheels. A fully functional braking system is essential for your safety, the safety of your passengers and the safety of other road users. The braking system has high-tech components that use friction to slow the vehicle down to a complete stop. Over time, friction and heat cause wear on your brake system and all its components. It is essential to carry out regular inspection and maintenance of your brakes. Check your owner's manual or ask your Pneu Select’ service consultant at Prieur & D. Brunette Inc. for the inspection schedule recommended by your vehicle manufacturer. Replacing the oil and filter is one of many preventative maintenance services that help promote maximum performance of your vehicle and extend its life. This mechanical maintenance also helps keep the inside of the engine clean and ensures a good performance. Inspections are essential because over time the oil becomes saturated with contaminants and excess particles accumulate in the engine, where they can form deposits and cause considerable wear. Check the manufacturer's recommendations in the vehicle maintenance manual for the oil change schedule. Remember to change transmission and brake fluids. The heating, ventilation and air conditioning system in your vehicle requires regular maintenance for better performance and seasonal operation. If you notice warning signs of air conditioning malfunction, such as reduced cooling efficiency, or a strange smell or noise, you should make an immediate appointment with your Pneu Select’ service consultant at Garage A. Prieur & D. Brunette. Detecting and quickly repairing small defects will prevent bigger problems for your vehicle. The muffler is a means of limiting the noise produced by the exhaust gases of combustion engines. As well as directing toxic gases from the engine to the outside, the exhaust system reduces emissions and cools combustion gases. It therefore affects engine performance. Regular inspection of your exhaust system is important. We suggest you make an appointment with Garage A. Prieur & D. Brunette Inc. if you notice anything unusual about the system (noise, smoke, under-floor vibrations or knocking, sudden loss of power, etc.). Your vehicle’s steering and suspension systems maintain stability and contribute to your safety and comfort. Well-performing steering and suspension systems enable the driver to maintain vehicle control at all times. In all vehicles, steering and suspension components weaken over time. Potholes, off-road driving or erratic driving also damage your vehicle’s suspension and steering. Excessive bouncing, irregular control of steering and braking and uneven tire wear are all signs of problems your with suspension and steering. Make an appointment with your Pneu Select’ technic advisor at Garage A. Prieur & D. Brunette for a check-up of both systems during wheel alignment. 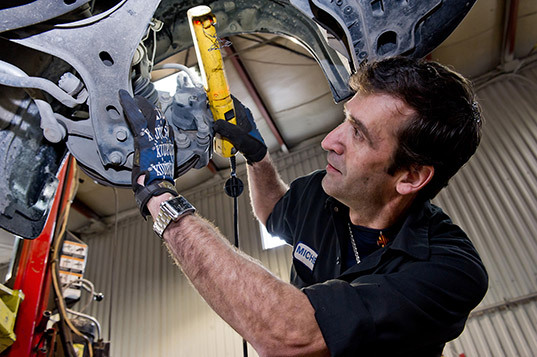 You can depend on the expertise of our mechanics to repair or modify your suspension. The best way to keep your vehicle longer is to perform mechanical inspections regularly. These precautions will increase your chances that your car will run well and remain safe and reliable for years to come. Garage A. Prieur & D. Brunette provides Gold and Silver Inspections. For our Gold Inspection, our experts check 95 points on your vehicle during tune-ups. For our Silver Inspection, our experts check 19 points on your vehicle during tune-ups. Used tires are an environmental challenge. This is why the Quebec tire recycling industry has taken concrete measures to ensure the recycling of used tires. As of October 1, 1999, the Quebec government has imposed a $3 environmental tax on the purchase of new tires for road vehicles and other equipment. This tax, intended among other things to empty out used tire storage dumps, entitles you to bring your old tires to a garage or tire dealer. Garage A. Prieur & D. Brunette as a Pneu Select’ branch have at heart the preservation of the environment, space is set aside in our warehouse for recycling your tires. For more information, please contact your consultant. We understand that when you entrust your vehicle to us, your normal life has got to carry on. To enable you to continue your usual activities, Garage A. Prieur & D. Brunette Inc. has at least 10 courtesy vehicles available for customers. Check with your consultant for the availability and cost of this service. Ask about additional opening hours during the fall and spring seasons. Areas Served : Vaudreuil-Soulanges : Coteau-du-Lac, Hudson, L'Île-Cadieux, L'Île-Perrot, Les Cèdres, Les Coteaux, Notre-Dame-de-l'Île-Perrot, Pincourt, Pointe-des-Cascades, Pointe-Fortune, Rigaud, Rivière-Beaudette, Saint-Clet, Saint-Lazare, Saint-Polycarpe, Saint-Télesphore, Saint-Zotique, Sainte-Justine-de-Newton, Sainte-Marthe, Terrasse-Vaudreuil, Très-Saint-Rédempteur, Vaudreuil-Dorion, Vaudreuil-sur-le-Lac et les environs.